A couple weeks ago, Suja was kind enough to send me some juices to try out, just because, with no obligation to write anything on them. 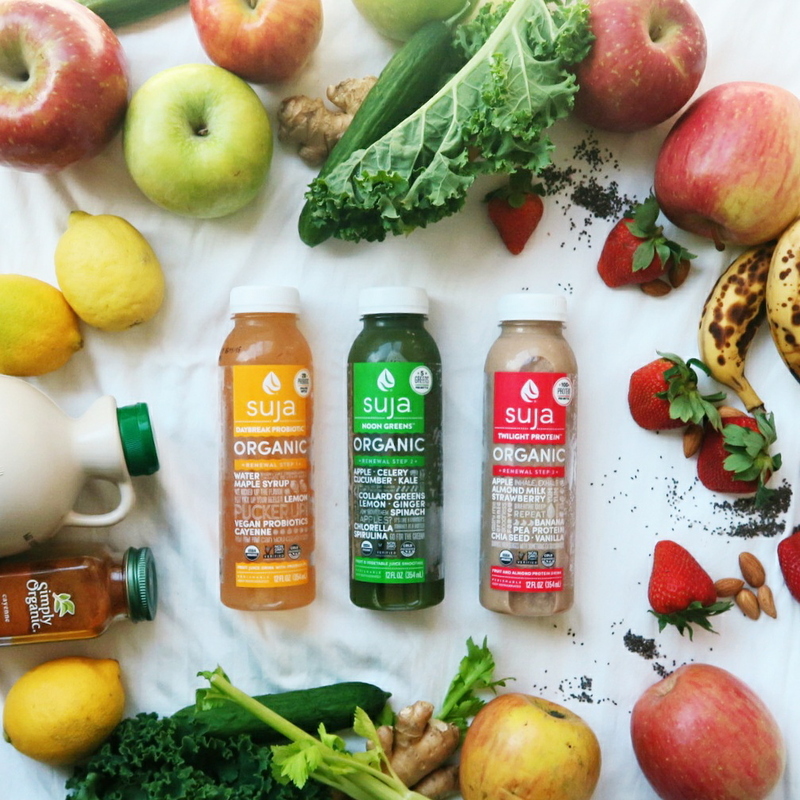 A little info about Suja--they are an Organic Non-GMO, Cold-Pressed juice company--in short. Since I was able to try their juices, I thought I would take the time to at least review the 1-Day Renewal juices I received in their care package! The Organic 1-Day Renewal includes 3 juices: Daybreak Probiotic, Noon Greens and Twilight Protein. This 1-Day Renewal plan also comes with a meal plan you can download on their site that suggests the little mini meals you eat in-between drinking the juices so you don't solely rely on drinking these juices. 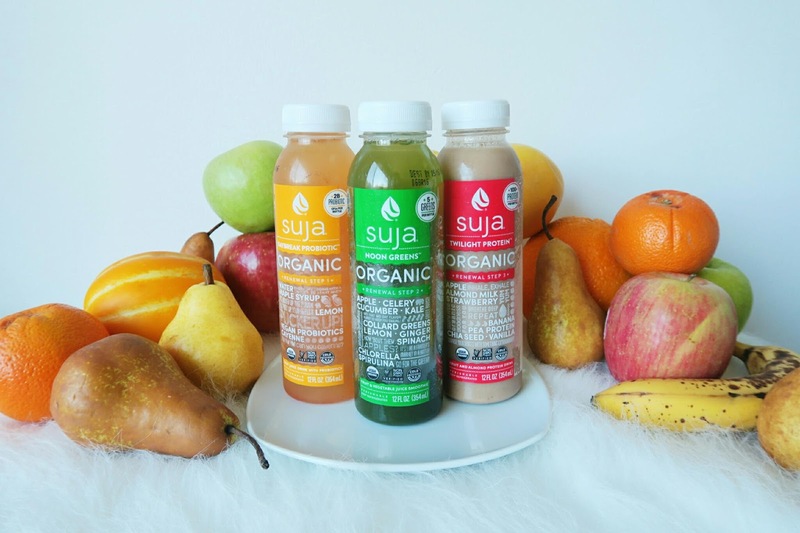 "At Suja Juice, we believe that healthiness is the root of all happiness. We also believe that healthy choices leave us feeling energized, bright, and alive. These beliefs led us to create the 1-Day Renewal to help you jump start healthy eating habits by pairing Organic, Non-GMO & Cold-Pressured juices with a healthy, whole food meal plan. 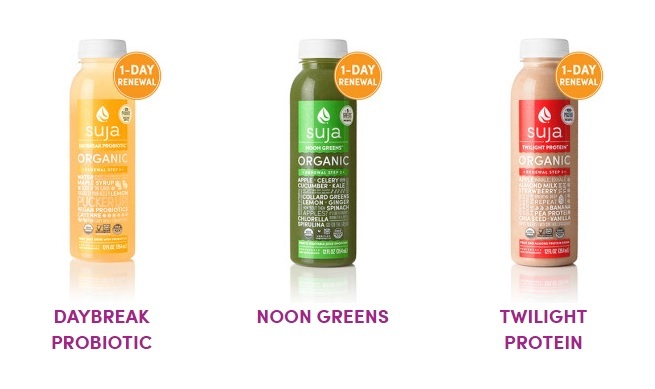 With the 1-Day Renewal, you will enjoy three delicious juices (one for morning, noon & night) that provide the healthful nourishment your body craves. In addition, you will consume healthy mini-meals throughout the day to work harmoniously with all three juices. Total foodie? Check out our meals to enjoy at home. Take out queen? Choose from our grab-and-go options!" 1) Daybreak Probiotic: water, maple syrup, lemon, vegan probiotics and cayenne. 2) Noon Greens: apple, celery, cucumber, kale, collard greens, lemon, ginger, spinach, chlorella and spirulina. 3) Twilight Protein: apple, strawberry, almond milk, banana, pea protein, chia seed, and vanilla. I followed the meal plan as best as I could with ingredients I already had at home. 1) After I drank the Daybreak Probiotic, I waited around 30 minute and ate half an avocado with some pumpkin seeds and a dash of cayenne (Grab n' go option 2). I felt pretty satisfied after I ate and didn't really get feel hungry until a couple hours later but instead of drinking the 2nd bottle of juice, I drank a glass of water and the hunger pangs went away. Daybreak Probiotic was a lot sweeter than I had imagined it to be but not overwhelmingly so. It balanced out the tartness of the lemon and the kick of cayenne definitely gave me a boost for the day. 2) About 3 hours total after I had my first juice, I drank the Noon Greens. About 30 minutes later, I drank some water and opted for another Grab n' go option #1 where I ate a whole banana with cashew butter (my new obsession!). This kept the sweet cravings away but I still felt like I needed a little something more, especially since I would be teaching a fitness class later, so I also ate a handful of almonds and drank more water. The Noon Greens was definitely a lot more cooling and 'green' tasting, but I love green juices so this doesn't bother me at all. I like the slight sweetness the apple brings and the bit of ginger definitely warmed things up. 3) The last juice/smoothie I had was Twilight Protein and had it after I got home from teaching around 3-4 hours after I had drank the Noon Greens. For my meal, I mixed a bit of option 1 and 3--I had a baked sweet potato and also a side of salad that included young mixed greens, tomatoes, avocado, dulse and nutritional yeast. It was definitely filling for the night. I really enjoyed this juice especially with the chia seeds and added pea protein. It was just what I needed after an active night. It also tasted really good too and the strawberries, almond, and vanilla made it feel like a dessert. Overall, I am impressed with this Organic 1-Day Renewal and my body even felt lighter, in a good way. The meals in-between the juices definitely make it easy to transition into and cleans up your body from all the processed foods with refined sugar and other stuff that isn't great for you body. I didn't find myself as hungry as I thought I would be, which is a good thing in my book! It's not a traditional 'cleanse' where you solely drink juice/water/tea the whole day which I find to be actually easier since it won't shock your body as much. I could definitely see myself doing this renewal once a month, or even more. I can even see myself substituting more juices in between rather than the meal options for a more 'cleansing' effect. I really do recommend this for anyone looking to juice more in their life but don't quite have the time to juice or willpower to stick to just juicing. The meals in between play a big factor in making this more accessible to everyone. 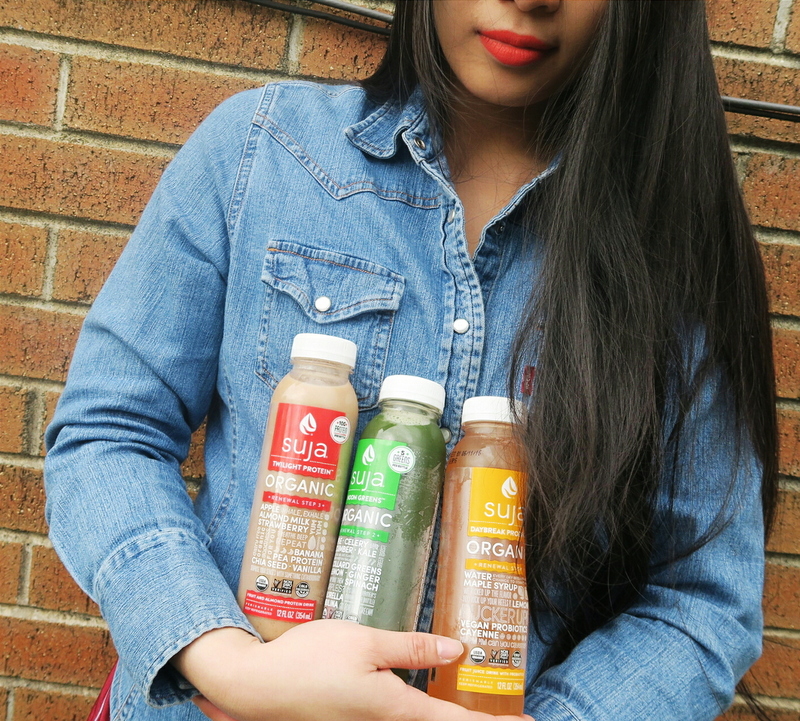 Have you guys every tried Suja or any other type of cold-pressed juices? How about cleanses? What are your favorites? I'd love to hear more!